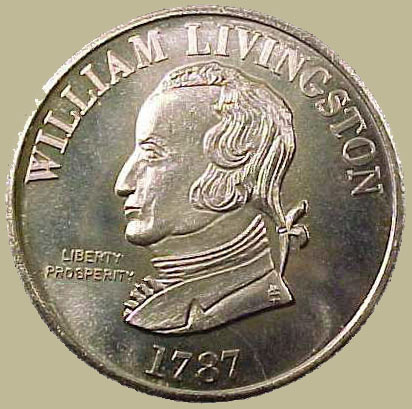 Livingston was born in 1723 at Albany, NY. His maternal grandmother reared him until he was 14, and he then spent a year with a missionary among the Mohawk Indians. He attended Yale and graduated in 1741. Rejecting his family's hope that he would enter the fur trade at Albany or mercantile pursuits in New York City, young Livingston chose to pursue a career in law at the latter place. Before he completed his legal studies, in 1745 he married Susanna French, daughter of a well-to-do New Jersey landowner. She was to bear 13 children. Three years later, Livingston was admitted to the bar and quickly gained a reputation as the supporter of popular causes against the more conservative factions in the city. Associated with the Calvinists in religion, he opposed the dominant Anglican leaders in the colony and wielded a sharply satirical pen in verses and broadsides. Livingston attacked the Anglican attempt to charter and control King's College (later Columbia College and University) and the dominant De Lancey party for its Anglican sympathies, and by 1758 rose to the leadership of his faction. For a decade, it controlled the colonial assembly and fought against parliamentary interference in the colony's affairs. 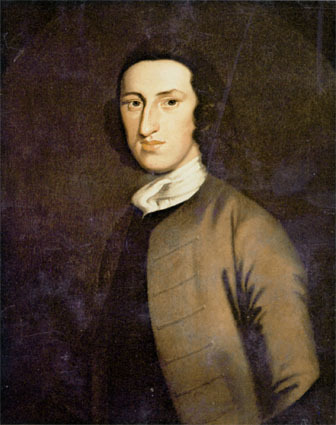 During this time, 1759-61, Livingston sat in the assembly. In 1769 Livingston's supporters, split by the growing debate as to how to respond to British taxation of the colonies, lost control of the assembly. Not long thereafter, Livingston, who had also grown tired of legal practice, moved to the Elizabethtown (present Elizabeth), NJ, area, where he had purchased land in 1760. There, in 1772-73, he built the estate, Liberty Hall, continued to write verse, and planned to live the life of a gentleman farmer. The Revolutionary upsurge, however, brought Livingston out of retirement. He soon became a member of the Essex County, NJ, committee of correspondence; in 1774 a representative in the First Continental Congress; and in 1775-76 a delegate to the Second Continental Congress. In June 1776 he left Congress to command the New Jersey militia as a brigadier general and held this post until he was elected later in the year as the first governor of the state. Livingston held the position throughout and beyond the war--in fact, for 14 consecutive years until his death in 1790. During his administration, the government was organized, the war won, and New Jersey launched on her path as a sovereign state. Although the pressure of affairs often prevented it, he enjoyed his estate whenever possible, conducted agricultural experiments, and became a member of the Philadelphia Society for Promoting Agriculture. He was also active in the antislavery movement. In 1787 Livingston was selected as a delegate to the Constitutional Convention, though his gubernatorial duties prevented him from attending every session. He did not arrive until June 5 and missed several weeks in July, but he performed vital committee work, particularly as chairman of the one that reached a compromise on the issue of slavery. He also supported the New Jersey Plan. In addition, he spurred New Jersey's rapid ratification of the Constitution (1787). The next year, Yale awarded him an honorary doctor of laws degree. Livingston died at Liberty Hall in his 67th year in 1790. He was originally buried at the local Presbyterian Churchyard, but a year later his remains were moved to a vault his son owned at Trinity Churchyard in Manhattan and in 1844 were again relocated, to Brooklyn's Greenwood Cemetery. Lawyer, first governor of the state of NJ, grandson of Robert and brother of Philip and Peter Van Brugh Livingston, was in many ways the ablest of the sons of Philip and Catharine (Van Brugh) Livingston. He was born at Albany (baptized December 8, 1723), and spent his childhood there under the indulgent care of his maternal grandmother Sarah Van Brugh. At the age of fourteen he lived for a year with a missionary among the friendly Mohawks, an experience which his family felt would be valuable if the lad turned his attention later to the fur trade or the possibilities of land speculation on the frontier. The following year he was sent to New Haven to follow the path chosen by his three elder brothers. He graduated from Yale in the class of 1741. While in college he decided that law had a larger claim than mercantile affairs upon his interest. Accordingly, he avoided his brothers' counting houses in New York City and entered the law office of James Alexander, who had been a vigorous champion of the freedom of the press in connection with the Zenger trial. Livingston married Susanna French, the daughter of a wealthy New Jersey landholder. Henry Brockholst Livingston was their son; their daughter Susanna married John Cleves Symmes, their daughter Sarah became the wife of John Jay. From the day of his admission to the bar in 1748 Livingston was a leader among those of assured position who liked to be known as supporters of the popular cause. Petulant and impatient of restraint, he soon aroused the resentment of the conservatives by his sweepiang criticism of established institutions. Always more facile in writing than in speech, he delighted to compose satirical verse and witty broadsides which earned him a greater reputation as a censor than as a satirist. A young lady of his acquaintance, alluding to his tall, slender, and graceless figure, named him the "whipping post." His appeals against the union of church and state aroused the noncomformists and strengthened the liberal party, which was rapidly becoming a Livingston faction in provincial politics. The first important victory of the Livingstons at the polls resulted in driving the De Lanceys from their control of the Assembly in 1758. In disappointment he penned A Soliloquy (1770), purporting to be a meditation of Lieutenant-Governor Colden, which beneath a thin veneer of satire was an unsparing invective against the provincial representative of British authority. Never entirely happy in his legal work and temporarily dispirited by the turn of his political fortunes, Livingston determined to retire to his country estate near Elizabethtown, NJ. Years earlier, in his Philosophic Solitude (1747), he had ventured to reveal in verse his longing for the quiet of the countryside. In May 1772 he laid out pretentious grounds, planted an extensive orchard, and erected a mansion known as "Liberty Hall." There he began life anew as a gentleman, but he did not find solitude. The removal to New Jersey was merely a prelude to a career more illustrious than the one just finished in New York politics. 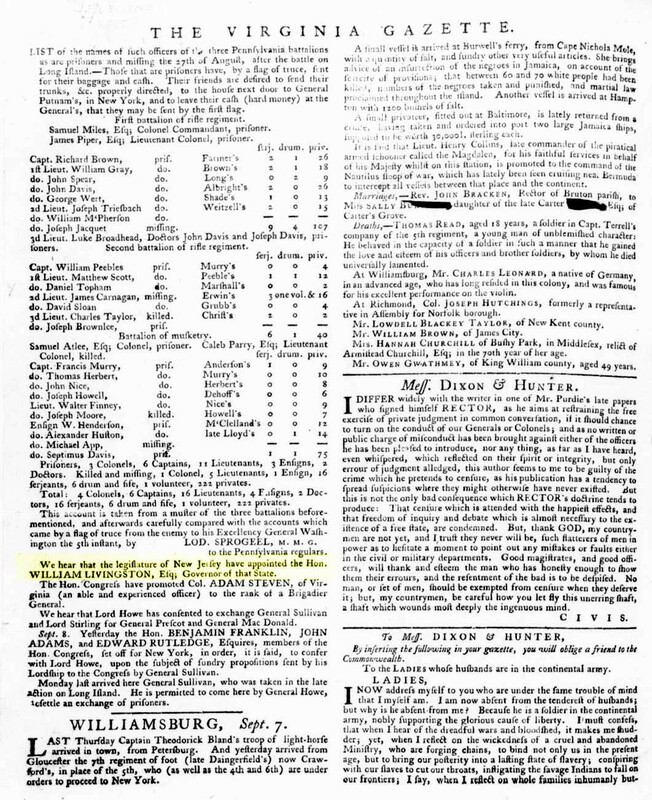 Becoming a member of the Essex County Committee of Correspondence, he quickly rose to a position of leadership and was one of the province's delegates to the First Continental Congress. There he served on the committee with his son-in-law, John Jay, and Richard Henry Lee to draft an address to the people of British America. He was returned as a deputy to the Second COntinental Congress, serving until June 5, 1776, when he assumed command of the New Jersey militia. It was a responsibility extremely irksome ot him, yet he discharged his duties with his usual conscientiousness until the legislature under the new constitution elected him first governor of the state. For the next fourteen years he bore the responsibilities of the governorship during the extraordinary conditions of war and reconstruction. The multitudinous duties, civil and military, the threats of the enemy, and the disloyalty of friends harassed his nervous and excitable temper but failed to overcome his spirited support of the patriot cause. Rivington's Royal Gazette dubbed him the "Don Quixote of the Jerseys." His boundless energy was an incalculable asset during the gloomiest period fo the war. When peace came his messages to the legislature dealt discriminatingly and comprehensively with the problems of reconstruction. He opposed the cheapening of the currency by unrestricted issues of paper money, counseled moderation in dealing with the Loyalists and their property, and looked forward to the day when the question of slavery would be settled on the basis of gradual emancipation. As authority slipped out of the hands of Congress, he called for a revision of the Articles of Confederation, in which he was privileged to participate at the Federal Convention of 1787. Though he was not conspicuous in debate, he ably supported the New Jersey plan and worked for a compromise that would mean success. HIs influence was largely responsible for the alacrity and unanimity with which the state convention ratified the Constitution. Two years later, while he was resting at Elizabethtown, his years of public service came to an end. Though his life was spent in the excitement of political strife and affairs of state, he longed for the quieter routine of the farmer. After his removal to New Jersey he managed to devote some time to experiments in gardening, becoming an active member of the Philadelphia Society for the Promotion of Agriculture. It was his pleasure to show his friends his vegetables at "Liberty Hall." Among his intimates and in an ever-widening circle of acquaintances he was honored for his high moral courage and his fine sense of social responsibility. The confidential agents of the French government reported to Paris that he was a man who preferred the public good to personal popularity. No better estimate in brief compass remains in the writings of his colleagues than the sketch penned by William Pierce in 1787 (Farrand, post, III, 90). 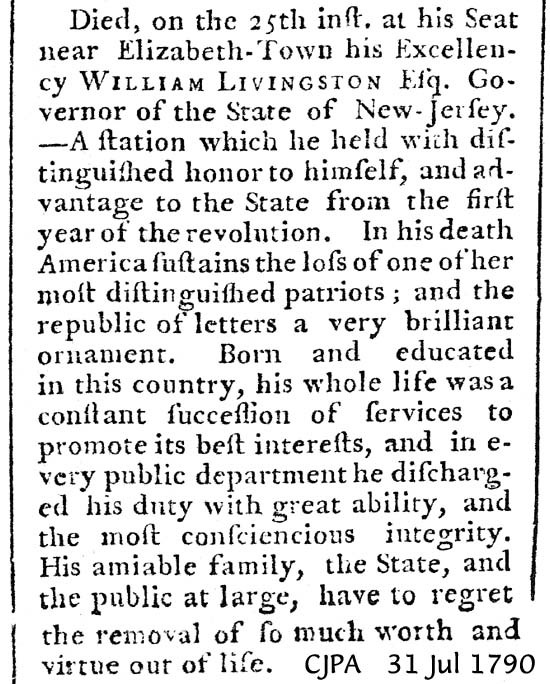 "Governor Livingston," wrote the Georgian, "is confessedly a man of the first rate talents, but he appears to me rather to indulge a sportiveness of wit than a strength of thinking. He is, however, equal to anything, from the extensiveness of his education and genius. His writings teem with satyr and a neatness of style. But he is no Orator, and seems little acquainted with the guiles of policy." The New York Public Library has an outstanding collection on the Revolutionary period. Gansevoort-Lansing Papers: This collection includes 25,000 manuscripts documenting the careers of the Revolutionary officer General Peter Gansevoort and his descendants. William Livingston Papers: The correspondence and papers of William Livingston from 1775 to 1782 (950 items). Schuyler Collection: This collection of the papers of General Philip Schuyler includes 2,431 letters to him from military officers, members of Congress, committees of safety, and private individuals, mostly relating to the conduct of the war in the Northern Department from 1775 to 1777. A large collection of Livingston's very personal letters to his friend, Rev. Noah Welles, Henry's father-in-law.